Home > Blog > Is Chewing Gum Really Bad for Your Teeth? It seems like every day we hear another story that one food or another is bad for our health. And we’re not just talking donuts and greasy foods! Some foods that are traditionally considered to be good for us, like dried fruit or yogurt, may end up being less healthy than we’d originally thought. This kind of news can make eating stressful, as we’re always wondering what is considered to be “healthy” for us. Well, we can be confident in saying that chewing gum can actually be good for your oral health, by keeping your gums and teeth clean. But, there’s a little more to it. The problem with gum isn’t the gum, but the flavor. Fruit or mint flavored gum isn’t typically the kind that’s good for your teeth. The sugar in many popular chewing gum brands is bad for your teeth and your health. Finally, there is a natural sugar substitute called xylitol that some studies show reduced the amount of cavity-causing bacteria in your teeth. Therefore, sugar free gums that have xylitol, like Simply Gum and Spry can help keep your teeth clean and improve your oral health. Luckily, you don’t have to remember brands to choose a safe chewing gum. There is an easy way to find which gums fit these categories and are safe to chew. Gums that have the ADA Seal are proven to have sugar substitutes that are safe for your teeth. These gums can be safely used for enjoyment as well as preventing cavities. Are There Downsides of Chewing Gum? 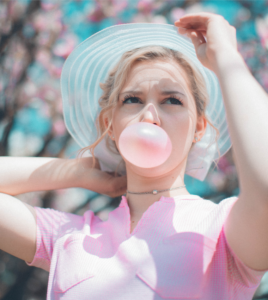 Despite research showing the positives of chewing sugar free gum, there are precautions you should always keep in mind when chewing gum. The major takeaway is that extended chewing can be bad for your teeth over time. We’re talking chewing for hours at a time—which can cause excessive wear and tear. Chewing should be limited to 20-30 minutes at a time so that your mouth has a chance to take a break. Finally, if you are experiencing tooth pain or have issues with other oral problems, chewing gum can exacerbate the problem. If you have pain or have more questions about chewing gum and your teeth, contact us by scheduling an appointment online or calling our office at 978-688-4441 today.